If you have been wondering about the effect of Virginia’s 2018 General Assembly session on electric regulation in Virginia, we have good news for you. The GreeneHurlocker Principles of Electric Utility Regulation in Virginia, the firm’s complete guide to the state’s electric regulation laws, has been revised to incorporate legislation enacted by the 2018 General Assembly and signed by Governor Northam. “The statutes governing Virginia’s electric utilities, found in Title 56 of the Code of Virginia, are extremely complex, but we’ve done our best to explain these laws in plain English,” one of the firms energy lawyers, explains. 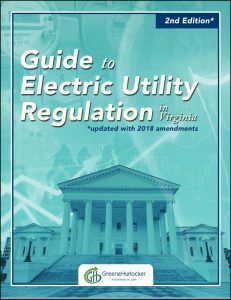 The guidebook and its glossary of key terms is intended to be a reference tool for those who want to gain a better understanding of utility regulation and energy policy in Virginia. In 2018, the General Assembly made substantial changes to the rate setting portions of the law and added new incentives for utilities to invest in clean energy and grid transformation projects. The updated guidebook summarizes the major amendments made by the legislature earlier this year. If you would like a copy of the guidebook, contact any of our energy lawyers, or download the complete document here.